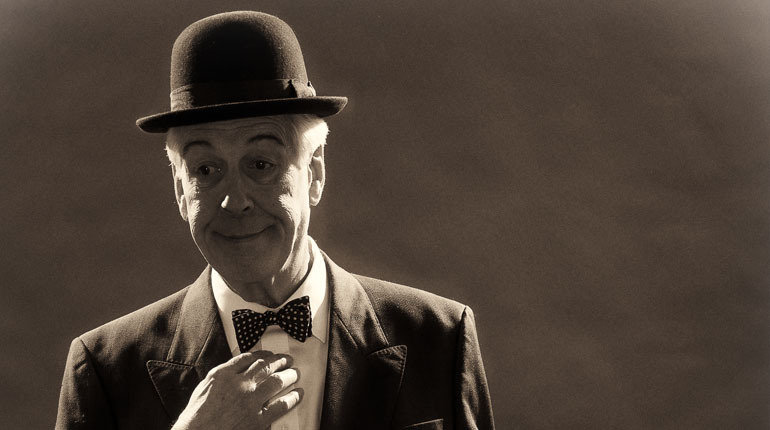 And This is my Friend Mr. Laurel – Viking Theatre – Review by Frank L.
On a bare stage which contains a simple wooden folding chair and the iron frame of a bed, both painted white, Jeffrey Holland dressed as Stan Laurel enters. He is in the bedroom of his old chum, Ollie Hardy, on a visit to Ollie’s home. He addresses the empty iron frame of a bed where Ollie is lying unable to speak or move. Stan conducts a ‘conversation’ with the mute Ollie which ranges over his health, Stan’s health, their various marriages (of which there were many) along with reminisces of happenings here, there and everywhere. You are a fly on the wall as two friends talk about old times. Holland intersperses these moments with short recreations of some of the routines for which Laurel and Hardy were famous accompanied with the appropriate music. His mimicking of both of them, but particularly Stan, is a joy to behold. Holland has a great knowledge of the pair and a corresponding admiration for their achievement with a particular devotion to Stan. He moves effortlessly through Stan’s varying emotions as he ‘chats away’ with his old comic partner stricken in the bed. He evokes the great love and respect that these two stage performers had for each other, honed over many years of success and which continued subsequently through their later years. The script brings you through their highs and lows and does not shy away from discussing the more gritty details of Ollie’s current health disabilities. This tribute was created in 2014 where it was acclaimed at the Edinburgh Festival and has returned there in 2015 and 2018. It therefore precedes the recent film “Stan and Ollie” but is even more poignant as Ollie’s incapacitated ‘presence’ is one of non appearance. The audience is left to imagine his plight. The show lasts about sixty minutes but after a short break Holland returns to the stage to participate in a Q&A with the audience. This show was created by Holland to fulfil ‘a long held desire to pay tribute to his hero Stan Laurel’ and he does his hero proud. It is a fine journey down memory lane.